Editor’s note: Scott Moore is Giorgio Ruffolo Doctoral Research Fellow at the Belfer Center for Science and International Affairs, Harvard Kennedy School. He was a guest researcher at Brookings’ John L. Thornton China Center and Brookings-Tsinghua Center for Public Policy in the spring of 2012. His research project was made possible by the generous support of the Ford Foundation. Among the many challenges to China’s current economic development trajectory, water resource constraints are among the most worrisome. According to Barry Naughton, one of the foremost experts on the Chinese economy, “China’s greatest development challenges…are in the areas where a dense population pushes up against the limits of water and what the land can provide.” The water resource challenge to China’s development is exceptionally complex, encompassing a blend of geographical, political, economic, and social dimensions. This Issue Brief describes the root causes of China’s water resource challenge, assesses the Chinese government’s policy response to date, and finally offers recommendations to increase the effectiveness of these policies. In short, China’s water resource challenge consists of both water quantity and quality issues, each of which present distinctive challenges for Chinese policy. Although the Chinese government is implementing perhaps the world’s most ambitious water resource management strategy, its efforts risk being undermined by inter-governmental rivalries, corruption, and incentives that favor economic development over sustainable resource use. In particular, inter-jurisdictional conflicts over water resources threaten to undermine policies to address water scarcity, while mis-matched incentives between pollution control and economic development at local levels of government threaten to undermine water quality control objectives. In aggregate, China possesses substantial water resources, constituting the world’s fifth-largest national endowment of fresh water. By per-capita standards, however, China’s water resources are much more modest at approximately 2000 cubic meters per person annually, as compared to a global average of about 6200 m3/person/year. These aggregate statistics nonetheless conceal marked regional discrepancies in precipitation and irrigation patterns, which combined with uneven distributions in population and economic activity mean that some areas possess plentiful water resources while others face chronic and crippling shortages. While residents of the sparsely populated, mountainous southwest enjoy some 25,000 cubic meters of freshwater per person annually, those of the populous and arid north have less than 500. Some of China’s largest and fastest-growing urban areas, notably Beijing and Tianjin, and its most water-intensive crops, especially wheat, are located and grown in the arid north, where annual precipitation is less than one-third of that in southern coastal areas. For the past few decades, water-stressed areas have relied on groundwater to make up the difference, but since at least the 1970s rates of withdrawal have become unsustainable, and water tables are dropping by approximately one meter annually throughout the North China Plain. Apart from making water more difficult and expensive to access, over-pumping of freshwater allows saltwater to penetrate aquifers in some areas, rendering them unfit for human consumption. Other factors exacerbate this fundamental geographic mal-distribution of water availability and demand. Climate change is expected to intensify aridity in northern China, enhancing its scarcity of both surface and subsurface water supplies. Moreover, although the arid north depends on irrigated agriculture, its irrigation systems are exceptionally inefficient. Less than half the water withdrawn for irrigation actually reaches crops because of leaky equipment and rapid evaporation, while the overall economic productivity of water is about US$3.50 per cubic meter, compared to a developed-nation average of US$36. Rising demand for water-intensive crops like wheat, as well as other commodities which require large quantities of water to produce, process, and refine, further stress water resources. China’s coal use, in particular, contributes to its water scarcity challenges—independent estimates suggest that it takes between 800 and 3000 gallons of water to process a ton of coal. China’s largest coal basin stretches across five provinces in the North, and the scarcity of water there is already constraining production, especially for smaller, less-efficient mines. These growing pressures on water resources, particularly in north China, are of mounting concern to the Chinese government. The Vice-Minister for Water Resources confided last year that China faces an “increasingly grim” water scarcity situation. The Chinese government has adopted two basic policy responses to the water scarcity problem. First, it has continued to finance the gigantic South-North Water Transfer Project, or SNWTP (Nanshui beidiao gongcheng 南水北调工程). 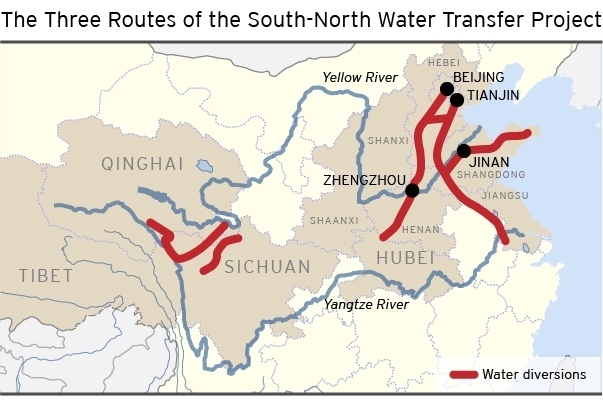 The SNWTP eventually aims to transfer some 45 billion cubic meters of water per year from central and southwest China to augment the flow of the Yellow River and meet urban water demand in the Beijing-Tianjin region. The Project envisions eastern, central, and western routes, of which the first is under construction and the second in a stage of advanced planning. All three routes pose enormous technical challenges: the eastern and central routes will be channeled under the Yellow River, while the western route entails pumping water at elevations of 10-16,000 feet above sea level over part of the Himalayan mountain range. Although completion of the three routes is expected to meet projected water demand growth in the north, thus redressing China’s fundamental geographic disparity in water availability, its costs will be enormous. Estimates suggest a figure of around US$62 billion, the final cost is likely to be markedly higher. Moreover, estimates of the number of people who must be resettled range from several hundreds of thousands to over a million, adding substantial social disruption to the Project’s total cost. Moreover, the SNWTP has necessitated additional water diversion and storage works to bring water into regions tapped to export water to the north, as well as treatment facilities to ensure that the water is clean enough to supply drinking water to northern cities. In addition to the supply-augmentation approach represented by the SNWTP, the Chinese government has also attempted to improve water use efficiency and to limit overall demand. A 2002 Water Law attempted to establish a strict licensing regime whereby virtually all water resources were declared to be the property of the state, and water use was made contingent on obtaining a usage license from local authorities. At the same time, the Water Conservancy Commissions (WCCs; Shuili weiyuanhui 水利委员会) established under the Ministry of Water Resources (MWR; Shuilibu 水利部) in China’s major river basins were given comprehensive water use planning responsibilities which were intended to guide local water use licensing. Subsequent regulations have established the basis for water rights trading, and a few such transfers have taken place between municipalities. In 2010, China’s Communist Party Central Committee and State Council promulgated a “three red lines” (santiao hongxian 三条红线) policy intended to establish clear and binding limits on water quantity usage, efficiency, and quality. In early 2012, the State Council announced that the “three red lines” policy would limit total national water consumption to less than 700 billion cubic meters per year, amounting to approximately three-quarters of China’s total annual exploitable freshwater resources. In addition, the policy attempts to increase irrigation use efficiency to 60% by 2030. These headline policies are augmented by increased investment, including 1.8 trillion RMB in 2011-2015, primarily for irrigation infrastructure improvements, rural clean water delivery, and reservoir enhancements. In combination, these policies seek to redress China’s regional imbalance in water availability, while making overall water use sustainable. However, they are likely to be undermined by conflict between regions which are asked to bear the costs of storing and transferring water, and those which benefit as a result. The dynamics of these conflicts is illustrated by the case of a dam, first proposed in 1954, intended to be built on the upper reaches of the Yellow River in order to provide water to poor farmers in Ningxia. Gansu Province, claiming that the dam would inundate some of its best farmland, has managed to prevent construction of the dam by lobbying different elements of the central government than those which had supported the dam. The dispute remains unresolved; in 2010, Ningxia’s representatives to the China People’s Political Consultative Conference (zhengzhi xie shanghuiyi 政治协商会议) took the unusual step of presenting a petition to the full Conference to build the dam. Similarly, water-exporting provinces in central China have complained at the costs they are expected to bear as part of the SNWTP for water treatment, refugee resettlement, and other issues, prompting the central government to impose an “SNWTP tax” on Beijing and other beneficiaries of the project. Similar rivalries threaten to undermine water licensing and water rights trading schemes. In times of shortage, upstream provinces often reduce flows to their downstream neighbors, and regularly appropriate water in excess of MWR quotas. In short, although China’s current policies can theoretically alleviate the geographic imbalance in water resources, they do not adequately address the inter-jurisdictional political and economic conflicts which are likely to result. In a similar fashion, policies to improve water quality are undermined by the complexity of relationships between central and local levels of government. Water quality is arguably an even more serious problem than is water shortage. In rural areas, where less than half the population has access to purified water, agricultural run-off is the dominant pollution source, while in urban areas human and industrial waste are left largely untreated, contaminating both surface and underground water supplies. Recent reports from China’s environmental protection authorities indicate that in the country as a whole, less than half of China’s water can be treated to the point where it is safe for drinking, and a quarter of surface waters are so polluted that they are unfit even for industrial use. Independent estimates are even more pessimistic. This crisis of water quality has contributed to a serious environmental health crisis. Arsenic poisoning from contaminated groundwater is thought to be widespread, and in some areas high incidences of particular cancers have been linked to organic water pollution. The ecological impact of high pollution levels is also acute, dramatically reducing freshwater wild fish populations as well as driving larger animals like the baiji (白鱀豚), or Yangtze dolphin, to the very brink of extinction. Water pollution issues have, moreover, proved to be particularly politically contentious. In 2005, the accidental release of some 100 tons of carcinogenic chemicals into a river near China’s northeastern border with Russia produced a diplomatic crisis, and in 2001 pollution from dye factories in Suzhou provoked residents of downstream Jiaxing, Zhejiang Province to pool funds to buy old boats and sink them in the waterway, forming a dam that blocked up the polluted water into neighboring Jiangsu Province. The Chinese government’s policy responses to water quality issues rely largely on strengthening monitoring capabilities and enforcement mechanisms. The 2008 Water Pollution Law attempted to strengthen earlier legislation by providing for increased penalties, including stiff fines for the executives of polluting enterprises. As part of a broader push to expand monitoring of pollution, Regional Supervision Centers were established throughout China to keep an eye on local enterprises, and water quality bureaus were set up within the MWR’s river basin commissions. This institutional expansion has been complemented by continuing regulatory reform. The “three red lines” policy introduced a new requirement that 95% of tested water must meet national water quality guidelines, which have recently been expanded and updated to cover a wide range of organic and microbial pollutants as well as concentrations of heavy metals. To help meet these standards, the government announced in late 2011 a five-year, 380 billion RMB investment plan to improve urban wastewater treatment facilities, as well as the establishment of some 14,000 monitoring stations throughout the country to continuously monitor water quality. Just as regional rivalries threaten to undermine water quantity policies, however, bureaucratic fragmentation and capacity discrepancies threaten to de-rail these water quality initiatives. Although MWR is broadly responsible for water project construction and water quantity issues, the Ministry of Environmental Protection (MEP; Huanjing baohu bu 环境保护部) is primarily responsible for water pollution control. MEP is a relatively new entity, having been elevated to ministerial-level status only in 2008, and it is generally less powerful than the older and more established MWR. MEP also lacks institutional capacity relative to MWR; while MEP must supervise hundreds of thousands of enterprises with a core staff numbering in the hundreds, the MWR’s Yellow River Conservancy Commission alone employs some 30,000 people. This imbalance in resources means that MEP relies on local environmental protection bureaus (EPBs), over which it possesses only partial control, to enforce water pollution regulations. MEP’s difficulties in exercising sufficient supervision and enforcement of local EPBs are illustrated by a recent chemical pollution incident in Yancheng, Jiangsu Province. In 2004, environmental protection authorities raised concerns regarding water pollution in the city, and in 2005 the Biaoxin Chemical Company was fined for exceeding pollution discharge limitations and ordered to eliminate discharges into waterways within Yancheng. In 2008, local environmental protection authorities decreed that all industrial enterprises were to be re-located away from the city’s river, its primary source of drinking water. These directives were ignored, however, and in 2009 Biaoxin Chemical released large quantities of carbolic acid into the waterway, forcing some 200,000 people to rely on bottled water and wells for several days. MEP called a press conference pledging to punish those responsible, and a subsequent investigation concluded that company officials concluded simply that regulatory “compliance is expensive, evasion is cheap” (shoufa chengben gao, weifa chengben di守法成本高，违法成本低). As a result of the investigation, two local environmental protection officials were fired for neglecting their duties, and another five were reprimanded. Nonetheless, similar if less dramatic releases of highly toxic pollutants remain common, reflecting the institutional barriers to resolving China’s water quality crisis. China’s water quantity and quality problems coincide dramatically in the case of the Yellow River, where management efforts in recent decades have partially succeeded in easing chronic over-use of water resources while nonetheless leaving fundamental issues unaddressed. The Yellow is one of the world’s most intensively exploited river systems, being home to some 110 million people in the semi-arid North China Plain. Since the early 1970s, the scale of water withdrawal from the river has meant that it has failed to reach the sea for much of the year, a phenomenon known in Chinese as “desiccation of the Yellow” or Huangehe duanliu (黄河断流). In the early 1980s, the MWR’s Yellow River Conservancy Commission (YRCC; Huanghe shuili weiyuanhui 黄河水利委员会) formulated a provincial water resource allocation plan which granted the more economically-developed provinces of the middle and lower reaches the right to utilize much of the river’s flow. However, rapid population growth and economic development along the upper reaches outstripped estimates, and in 1995-1998, the Yellow failed to reach the sea for about 120 days each year, in some years failing even to reach Shandong Province. Consequently, in 1998 the YRCC promulgated more strict provincial water use regulations and began planning a sophisticated “Digital Yellow River” (shuzi Huangehe 数字黄河)system to monitor water use and flow conditions in near-real time. These efforts have been successful in halting the desiccation of the Yellow, which has continually reached the sea since 1999. However, flows remain below levels considered necessary to satisfy ecological needs, and water quality has continued to deteriorate, with the percentage of river water designated as “Class V” or lowest-quality water increasing from 34 to 42% from 1998-2001. Much of these lingering problems stem from the inter-jurisdictional conflict and mismatched incentives described above. Referring to the 1998 regulations, a 2011 YRCC report acknowledged that “In implementing the Yellow River water quantity regulations, there exist some localities which do not put into practice the water quantity allocation and dispatch plan, and exceed the allocation limits in using water resulting from inter-provincial flows not according with control limits.” A recent Caijing news report likewise notes that provinces skirt Yellow River allocation rules by extracting water from tributaries of the Yellow before it enters the main stream. “Tributary water quantity allocations are not clearly defined,” the report notes, “meaning that each province can utilize water before it enters the Yellow River, and before it becomes part of the Yellow River water quantity allocation limits.” The case of the Yellow River thus illustrates that while China has the capacity to address some of its pressing water resource challenges, fully meeting them will require deeper and more systematic reform of governance systems and institutions. Water Scarcity and Pollution: Constraints on China’s future? China’s water resource challenges are acute, but it has also developed a substantial policy infrastructure to meet them. What remains is to ensure that policies to address water scarcity and to improve water quality are implemented effectively and efficiently. The barriers to policy implementation identified in this Issue Brief reflect some deep-seated and systematic issues in China’s governance system. Inter-jurisdictional and inter-agency coordination, cooperation, and communication mechanisms are under-developed, while weaknesses in the rule of law undermine regulation and enforcement procedures. Fully addressing water quantity and quality issues therefore entails some basic and systematic institutional and political reforms, all of which will require substantial political will. Nonetheless, if this can be mustered, five reforms would greatly aid China in addressing water resource quantity and quality issues. First, the Party’s cadre evaluation system should be overhauled to emphasize environmental and water resource management metrics. Some reforms have already been undertaken, but economic and stability criteria remain of paramount importance. Although environmental outcomes are more difficult to measure than GDP growth, technologies like those employed in the Digital Yellow River system make it easier to hold cadres responsible for water quality and quantity issues within their jurisdictions. Second, formalized mechanisms for inter-provincial consultation should be established at regional scales. In particular, provincial governments should be given formal representation on the Water Conservancy Commissions which manage China’s major river basins on behalf of MWR. Although the Commissions maintain extensive links with local governments, formalizing representation would improve stakeholder involvement and enhance policy buy-in. Third, high-level encouragement should be given to inter-governmental cooperation on water resource issues, which are by nature inter-departmental. As part of this initiative, a high-level working group should be established under the State Council to coordinate policy implementation between MWR, MEP, and other relevant entities, and provide advice to decision-makers. This effort should be led by a senior leader, preferably at the Presidential or Prime Ministerial level, in order to ensure active participation by ministerial units. Fourth, the central government should aim to strengthen the legal system to enable more effective water rights trading. Title and trading procedures should be clarified, special courts for dispute resolution created, and markets brought to a larger scale. Ideally this effort should be undertaken as part of a broader set of legal reforms which might aim to strengthen judicial independence and the rule of law more generally. Fifth, both MEP and MWR should encourage the involvement of civil society groups in water pollution monitoring. Although the government is wary of such involvement, it can channel growing concern over water issues for constructive purposes by making civil society groups an adjunct to water pollution monitoring efforts. The gravity of China’s water resource challenges cannot be overstated—in order to chart a sustainable development pathway in future decades China must use substantially less water much more efficiently, while also improving water quality. The government has built the foundations of a credible policy response, but these must be strengthened, expanded and built upon if China is to avoid a water resource constraint to its future growth and development. Barry Naughton, The Chinese Economy: Transitions and Growth. Cambridge, MA: MIT Press, 2007, 30. World Bank, “Renewable internal fresh water resources per capita (cubic meters),” 2012, available at http://data.worldbank.org/indicator/ER.H2O.INTR.PC (accessed October 28, 2012). UN Food and Agriculture Organization, “China,” 2010, available at http://www.fao.org/nr/water/aquastat/countries_regions/china/index.stm (accessed 22 July 2012). Eloise Kendy, David Molden, Tammo Steenhuis, Changming Liu, and Jinxia Wang, Politics Drain the North China Plain: Agricultural policy and groundwater depletion in Luancheng County, 1949-2000. Colombo, Sri Lanka: International Water Management Institute Research Report 71, 2003; Jane Qiu, “China faces up to groundwater crisis,” Nature 466 (308): 2010, doi:10.1038/466308a. KP Chen and JJ Jiao, “Seawater intrusion and aquifer freshening near reclaimed coastal area of Shenzhen,” Water Science and Technology: Water Supply 7 (2007), 137-145. National Development and Reform Commission, National Climate Change Program. Beijing: National Leading Group on Climate Change, 2009. UN Food and Agriculture Organization, op. cit. Jeff Wilson, “Corn, soybeans, wheat gain as China’s demand for imports climbs,” BloombergBusinessweek, October 14, 2011, available at http://www.businessweek.com/news/2011-10-14/corn-soybeans-wheat-gain-as-china-s-demand-for-imports-climbs.html (accessed 28 October 2012). Keith Schneider, “Choke Point: China – Confronting water scarcity and energy demand in the world’s largest country,” Circle of Blue, February 15, 2011, available at http://www.circleofblue.org/waternews/2011/world/choke-point-chinaconfronting-water-scarcity-and-energy-demand-in-the-worlds-largest-country/ (accessed 28 October 2012). Zhang Jiaoyong, “Quanguo Shuiziyuan zonghe guihua [Comprehensive National Water Resource Plan],” Huanghe Shuili Weiyuanhui [Yellow River Water Conservancy Commission], August 2011, available at http://www.yellowriver.gov.cn/zwzc/zcfg/zcjd/201108/t20110811_82252.html (accessed 30 March 2012). Carla Freeman, “Quenching the Dragon’s Thirst: the South-North Water Transfer Project—Old Plumbing for New China?” China Environment Forum Report. Washington, DC: Woodrow Wilson International Center for Scholars, 2011. See National SNWTP Project Office, “Li Jincheng Fuzhuren diaojiu Nanshuibeidiao dongxian jiewu daoliu gongcheng he zhiwu gongzuo [Vice-Director Li Jincheng inspects the SNWTP east line pollution control efforts]”, available at http://www.nsbd.com.cn/NewsDisplay.asp?id=195490 (accessed 25 July 2012). Patricia Wouters, Desheng Hu, Zhang Jiebin, Philip Andrew-Speed, and Dan Tarlock, “The new development of water law in China,” University of Denver Law Review, 7, No. 2 (2004), 243-308; Dajun Shen, “River basin water resources management in China: a legal and institutional assessment,” Water International, 34, No. 4 (2009), 484-496. Nicola Cenacchi, Yunpeng Xue, Fu Xinfeng, and Claudia Ringler, “Water rights and water rights trading: option for the Yellow River basin?,” International Food Policy Research Institute, 2010. Zhou Jigang, Peng Guangcan, and Ceng Zhen, “Trading water in thirsty China,” China Dialogue, June 26, 2008, available at http://www.chinadialogue.net/article/show/single/en/2144-Trading-water-in-thirsty-China (accessed 28 October 2012). China Daily, “Water usage to be monitored better,” China Daily, May 8, 2012, available at http://www.china.org.cn/environment/2012-05/08/content_25332381.htm (accessed 28 October 2012). State Council, “Guowuyuan guanyu shixing zuiyange shuiziyuan guanli zhidu de yijian [State Council Opinion regarding the most strict water resource management system],” State Council Document No. 3 (2012), available at http://www.gov.cn/zwgk/2012-02/16/content_2067664.htm (accessed 25 July 2012). Xinhua, “China to invest heavily in water conservation,” Xinhua, February 10, 2012, available at http://news.xinhuanet.com/english/china/2012-02/10/c_131403240.htm (accessed 28 October 2012). Huanghe Shuili Weiyuanhui [Yellow River Water Conservancy Commission], Huanghe Guihuazhi [History of Yellow River Planning], Huanghezhi Quan Liu [Yellow River History Volume 6] (Zhengzhou, China: Henan Renmin Chubanshe [Henan People’s Press], 1991), p. 268-9. Freeman, op. cit., pg. 5. Caijing, “Huanghe zhengduozhan: shui quan zhuan rang shichanghua jincheng shouzu [Yellow River Turf Battle: Water rights trading hinders the process of marketization],” Caijing News, July 28, 2011, available at http://www.caijing.com.cn/2011-07-28/110791023.html (accessed 28 October 2012). Xinhua, “Half of China’s urban underground water polluted,” China Daily, May 28, 2012, available at http://www.chinadaily.com.cn/china/2012-05/28/content_15404889.htm (accessed 28 October 2012). David Stanway, “Pollution makes quarter of China water unusuable: ministry,” Reuters, July 26, 20120, available at http://www.reuters.com/article/2010/07/26/us-china-environment-water-idUSTRE66P39H20100726 (accessed 28 October 2012). Wen-Qing Lu, Shao-Hua Xie, Wen-Shan Zhou, Shao-Hui Zhang, and Ai-Lin Liu, “Water Pollution and Health Impact in China: a Mini-Review,” Open Environmental Sciences 2 (2008), 1-5. US National Oceanographic and Atmospheric Administration, “Chinese River Dolphin, “ February 17, 2012, available at http://www.nmfs.noaa.gov/pr/species/mammals/cetaceans/chineseriverdolphin.htm (accessed 28 October 2012). World Bank, Water Pollution Emergencies in China: Prevention and Response. Washington, DC: World Bank, June 2007. Tang Zhen and Zhou Haiwei, “Chang Sandiao diqu kuajie shuishi jiufen xieshang mianlin de wenti ji duice [Problems and Solutions Faced in the Resolution of Yangtze Delta Trans-boundary Water Disputes],” Shuili Jingji [Water Conservancy Economics], Vol. 25 No. 2: 2007, pp. 70-77. Xinhua, “Tougher law to curb water pollution,” China Daily, February 29, 2008, available at http://www.chinadaily.com.cn/china/2008-02/29/content_6494712.htm (accessed 28 October 2012). Scott Moore, “Shifting Power in Central-Local Environmental Governance in China: the Regional Supervision Centers,” China Environment Series, 11: 2010/2011, 188-200. Shanghai Daily, “Stricter water standards to be applied nationwide,” May 14, 2012, available at http://english.cri.cn/6909/2012/05/14/1461s699430.htm (accessed 28 October 2012). Global Water Intelligence, “Five years to clean up China’s wastewater,” Global Water Intelligence 13(1): January 2012, available at http://www.globalwaterintel.com/archive/13/1/general/five-years-clean-chinas-wastewater.html (accessed 28 October 2012). Interview with foreign consultant to Yellow River Conservancy Commission. Andrew Mertha, “China’s ‘soft’ centralization: shifting tiao/kuai authority relations,” China Quarterly, 184, December 2005, pp. 791-810. Abigail Jahiel, “The Contradictory Impact of Reform on Environmental Protection in China,” The China Quarterly, Vol. 149 (1997), pp. 81-103. For an English account see Dolly Wu, “Two govt officials fired over China’s Yancheng pollution,” ICIS, March 4, 2009, available at http://www.icis.com/Articles/2009/03/04/9197274/two-govt-officials-fired-over-chinas-yancheng-pollution.html (accessed 28 October 2012). Jean-Francois Tremblay, “Chinese mayor orders chemical plant closures,” Chemical and Engineering News, March 5, 2009, available at http://pubs.acs.org/cen/news/87/i10/8710news4.html (accessed 28 October, 2012). Li Dong, “Guowuyuan Huanghe fenshui yu shuidiao fangan [State Council Yellow River Water Division and Water Transfer Plan],” Shui Xinxi Wang [Water Information Net], available at http://www.hwcc.gov.cn/pub/hwcc/wwgj/bgqy/jjqk/201003/t20100302_314548.html (accessed 5 April 2012), Guowuyuan [State Council], “Guowuyuan Bangongting Zhuanfa Guojiajiwei he Shuidianbu guanyu Huanghe Kegong shuiliang fenpei fangan baogao de tongzhi [Notice by the State Council Office to the State Planning Commission and the Ministry of Water and Power regarding the Report on the Yellow River Water Use Quantity Allocation Plan],” Guowuyuan Wenjian [State Council Document] 1987, No. 61. Michael Giordano, Zhongping Zhu, Ximing Cai, Shangqi Hong, Xuecheng Zhang, and Yunpeng Xue, “Water Management in the Yellow River Basin: Background, current critical issues and future research needs,” Comprehensive Assessment of Water Management in Agriculture Research Report 3. Colombo, Sri Lanka: Comprehensive Assessment Secretariat, International Water Management Institute, 2004, p. 19. Shuilibu [Ministry of Water Resources], “Huanghe Shuiliang tiaodu guanli banfa [Yellow River Water Quantity Dispatching and Management Measures],” 14 December 1998, Tongzhi [Notice] No. 2520. China Daily, “Yellow River gets digital hydrological station,” China Daily, June 16, 2002. Available at http://www.china.org.cn/english/environment/34780.htm (accessed 28 October 2012). Giordano et al. 2004, p. 28. Huangshuihui [YRCC], “’Huanghe shuiliang tiaodu tiaoli’ zhiding yu shijian [Formulation and Implementation of the ‘Yellow River Water Quantity Dispatching Regulations’],” 14 August 2011, available at http://www.yellowriver.gov.cn/zlcp/kjcg/kjcg07/201108/t20110814_103291.html (accessed 5 April 2012). Caijing [Finance and Economics], “Huanghe shui zhengdouzhan: shuiquan zhuanrang shichanghua jincheng shouzu [Struggle over Yellow River water: water rights transfer and marketization process hits a snag],” 28 July 2011, Caijing Wang [Finance and Economics Net], available at http://www.caijing.com.cn/2011-07-28/110791023.html (accessed 5 April 2012). Kai-yuen Tsui and Youqiang Wang, “Between Separate Stoves and a Single Menu: Fiscal Decentralization in China,” The China Quarterly, Vol. 177 (2004), pg. 75.